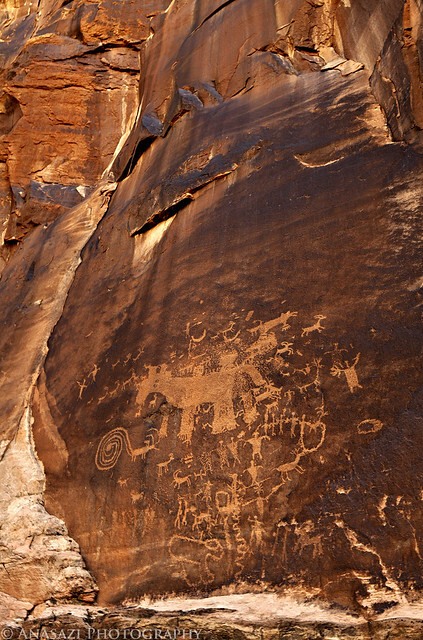 While hiking near Moab in search of new rock art a few weeks ago, we came across this large and impressive panel just as we were running out of light and needed to head back to the Jeep. This is a very cool panel containing a few interesting figures including the bighorn sheep with the large spiral tail. However, I have no clue what the largest and most prominent figure in this panel is? My first guess was a large bear because there are a few others around Moab, but after examining the figure closely, I really have no idea what it is. Feel free to comment with any guesses as to what it might be.